Joint Pain is probably the most common concern regarding health. It can greatly affect an individual's life; hence, it is important to seek the most excellent joint pain relief supplement. 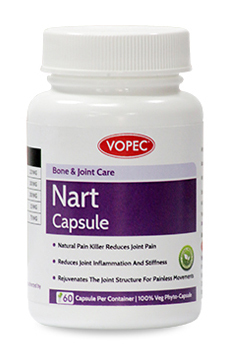 Nart Capsule contains pain reducing properties and helps in strengthening bones and muscles around the affected part. Nart capsules contain active herbal preparation for relieving pain, stiffness and inflammation of the joints. The formula works without the side effects of allopathic preparations. Patients using Nart have additionally reported increased flexibility of joints and the overall strengthening of bones and muscles of the affected joints. There have been no safety precautions identified during clinical assesment. It is always prudent to consult a physician for additional clarification. One to two capsules twice a day after meals or as directed by the physician. For best results, include Nart Oil as a topical application as part of the treatment. Digestive system over works to breakdown wastes and assimilate nutrients. Bio-chemistry of cells can experience imbalance. A sodium deficiency is an important long term background cause of bone and joint disorders. A deficiency leads to poor digestion and fermentation. This causes sodium to be drawn from the circulation to support the digestive system. Calcium is drawn from the bones to address this imbalance that cause weakness in its structure. This can make bones brittle. G Singh, P K Sharma, R Dudhe and S Singh - Biological activities of Withania somnifera. Is there any toxicity concern shown in the study of Nart capsules? Some herbal chemicals can induce mutations and can also be responsible for future mutations. Mutations are responsible for abnormal cell growth that could lead to toxicity and cancer. To test that there is no such effect, Nart capsules have been subjected to comprehensive research study. Using analysis known as 'bacterial reverse mutation' method, Nart capsules have been tested for mutagenicity, toxicity and carcinogenicity. The study showed that there was no significant finding for such toxicity.